I measured the angle of the top longeron at the cockpit while the plane is in the landing position, it is 14.5 degrees. That's a little steep in my mind. Three point landing should not be a problem! I'm not sure what other Pietenpol's measure with the large wheels. Prop clearance is 25" in the three point position. I will have to measure the clearance in the level position. By my estimate your pilot CG at 49.64" from the leading edge leaned back 4" would be about 11" forward of the seat back and bottom interesection if your plane is built according to the long fuselage plans. Or about 7.5" if the seat back is at a 15 degree angle as Ray built his Sky Scout. I imagine it is somewhere between those two values. Can you guys tell I retired this summer and have way too much time on my hands? 3-point nicely at that angle. Your formula looks just about right to me. in my Cub, and I find the same is true in my Pietenpol. (which is why most 170 owners tend to wheel land). Yes, good info, Jack. I never thought about what it was that made each of those aircraft handle as they do near the stall. 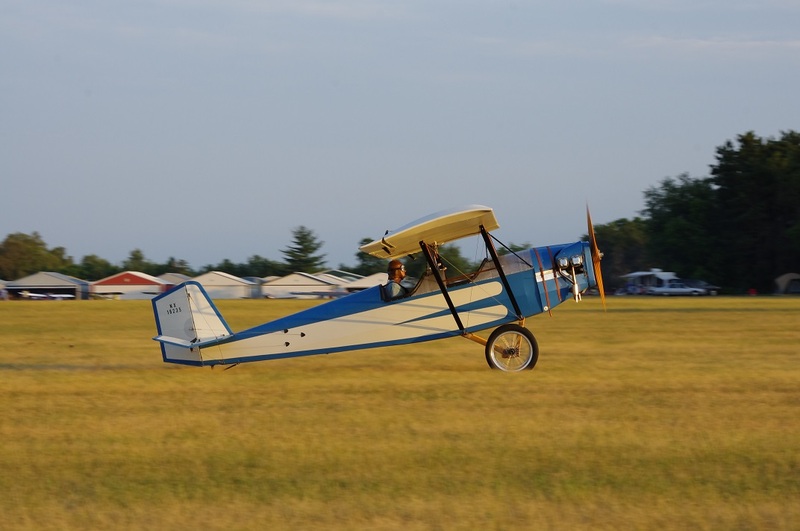 I learned to fly in a 40HP J-3 and made my first solo in it, so that airplane created my first impressions of how to land an airplane and what the sensations and visual cues should be right at the ground. The Cub must have taught me pretty well. Flying my Air Camper some 45 years after that first solo off the grass at Tims Airpark north of Austin, I find that I can now make perfect 3-point landings every time. Sometimes those perfect 3-pointers occur three feet off the runway, sometimes they are half that distance, sometimes they should have happened two seconds after the tires touched down and I'm ballooning up again, but occasionally the tires meet the runway at the same time the airplane stops flying ;o) In short, I know the theory perfectly and the airplane is willing to give it a go as many times as I want to put it in the landing attitude, but it usually turns out that I'm still a student and 41CC gets the last chuckle as we clear the active. I guess if that weren't the case, I might as well just have a big red toggle switch on the panel labeled "AutoLand" and I would soon grow bored of Pietenpoling. I learned in a 7AC Aeronca and have since owned two of them and a J-3. From memories of doing many straight on, power-off stalls, it seems to me that the AOA was far steeper than 10-13 degrees. I clearly remember wondering if the damn thing would ever stall so I could get the power back on and be done with that phase of the training. I also remember all the warnings it gave on incipient stalls when in steep turns...those mushy controls! But I must admit that I could sometimes not respond to such warnings while concentrating in the turns. And I've scared myself many times practicing approach stalls simulating base to final while letting the tail scoot too much....kinda gets one's attention! My intention is to measure the on-the-ground attitude of the Aeronca and then remember to take my digital protractor along on my next Aeronca flight. Not too much I can do about the AOA of the SkyScout on the ground at this time. Guess we will see how it lands on the first flights. Smaller wheels might be an answer. The 7AC AOA, as measure on the ground in 3-point is 11.2 degrees. Although my first solo was in a J-3, I didn't have enough money to continue flying while in college so I didn't go much further until I was out of school, working, and needing to get my private ticket so I could fly to and from jobsites on business. At that point, I had the resources to plop down enough money to schedule blocks of instruction time till I could take my checkride and get my ticket. I still wanted to learn in tailwheel aircraft so I sought out an instructor and FBO who could do that and picked up where I had left offf out of college when I found a tailwheel instructor and a GCAA Citabria. I flew most of my primary training in that aircraft until it was sold, then continued my advanced training in a Cessna 150/150 with the Texas Taildragger conversion. Later, I rented a Citabria 7KCAB and flew that on business as well. I found very great differences in the sight picture out the windscreen of those three airplanes in all flight regimes. The way I remember the GCAA, it had much the same feel and view out the front as the J-3 and I enjoyed flying that airplane. I seem to remember sitting deeper down in the seat in it though. In the 150/150, I felt like the 3-point attitude hardly looked much different out the front than the tri-gear 150! It felt like I wasn't really flying a tailwheel aircraft, other than having to stay on the rudder pedals. In the 7KCAB, the cowling and instrument panel seemed to block more of my forward view than in either of those airplanes, and of course with a fuel injected engine and 150HP the starting drill and performance were different from the GCAA. The point is, in the air they are all just airplanes but in the landing configuration there are significant differences in the visual cues and attitude and it takes some adjustment to get used to a new tailwheel airplane. What I found when I transitioned into the Air Camper, as I'm sure you'll find in the Sky Scout, is that it is not always waiting to jump on you or throw you off its back like a wild bronc. It gives you plenty of cues and it flies slowly enough on approach that you have time to think about what it's doing. And once you're "connected" to the airplane, the fun really begins because you can go fly without a long preflight, without a long checklist, without a lot of equipment or forethought, or even without a lot of mental preparation. You just go fly and you have fun doing it. You can handle the plane by yourself and you don't have to check your bank balance every time you taxi to the fuel pump. >By my estimate your pilot CG at 49.64" from the leading edge leaned back 4"
>somewhere between those two values. OK, today I spent some time taking measurements of my airplane with the fuselage leveled and plumb bobs dropped off the leading and trailing edges of the wing. Some very interesting findings, some that surprised even myself. 1. The wing chord on NX41CC is actually 60.5", apparently due to the metal trailing edge piece extending an extra 1/2" past the tails of the ribs as compared to plans. All this time I've been using 60" and never checked it. Lesson No. 1. 2. The cabanes are 23-1/4" (front) and 22-1/2" (rear) between pivot points, which makes them 2" taller (front) and 2-1/4" taller (rear) than plans. This raises the wing a little and subtracts 1 degree from the angle of incidence. Again, I never knew this about my airplane, so Lesson No. 2. I do know that it is very difficult to ever get a sharp or crisp stall, especially power-off, so perhaps slightly less wing incidence is the cause. 3. The cabanes are actually tilted back 3-1/2" from the vertical, and I've always thought that they were tilted back 4". Lesson No. 3. Boy, why did I ever think I knew this airplane? ;o) This gives me just a bit of encouragement that I can still incline the cabanes back a tad if I ever need to adjust the CG to get it forward a bit more. 4. The rear seat back on NX41CC is not perfectly square in both directions so all I can say is that it's somewhere between 83.7 and 84 degrees from the vertical (inclined back about 6 degrees), which places it just about exactly where the geometry works out from the plans. I fly very little of the time sitting in the complete upright position, so I have never felt like the seat back is too straight for me. My seat back has a little bit of naugahyde-covered foam padding and that seems to be fine. 5. The corner where the pilot's seat back meets the pilot's seat bottom is 1.5" forward of the wing trailing edge. With the pilot's CG at a measured/computed 49.64" aft of the wing leading edge, that places the pilot's CG 9.36" forward of the bottom corner of the seat bottom. Doug said it would be somewhere between 7.5" and 11" forward of the corner. Halfway between those two values would be 9.25", so his math was wayyyy off... a good 7/64" off ;o) Doug, you're *good* with numbers-!! Those are some interesting numbers you came up with. And I'm glad to know my math was not too far off! Just measured the deck angle of my airplane with it sitting on the ground in 3-point attitude: almost exactly 11 degrees. Knowing now that my wing is set with about 1 degree less incidence than it should have, I think I need to get the nose a bit higher. I had already been thinking about getting some slightly fatter tires (does anybody happen to know what size tires are on NX13691, "The Allen Rudolph Piet"? )- mine are 6.00x6 and I'm looking at some 8.00x6 weenies. Somewhere or the other I have a comparative analysis of the Piet airfoil vs. the Cub's USA35B and I'm curious as to what the lift looks like vs. the Piet at the same angle of attack. Jack wrote that the Cub has a 13 degree deck angle and that puts the wing close to the critical AOA, so I should be able to get some good info out of that comparison. Oscar, to get 15 degree deck angle, I had to jack my Pietenpol up quite a bit. I will check the angle when I go out next. So at what deck angle do most Piets stall? Did I miss something? My SkyScout's 3-point deck angle is 14-14.5 degrees. Seems pretty steep. My 7AC is about 12 degrees and I don't know where it stalls power-off. But it seems quite a bit higher that the 3-point angle. I will have to deflate my tires a bit....since the brakes might be pretty lousy! I will test taxi as soon as I patch a hole in the wing. Damn antenna on the Waiex! Does anyone remember the pounds of pull on the "Official Fish Scale" that has been ruled to be adequate? I don't have the "Official" scale. But one similar! Could not be too far off! There was some discussion at Brodhead this year about this very thing. Piets are much less than that. On mine, my deck angle is 12.5 degrees. tail wheel, I had to make my gear legs a little longer to go that high. Steve D.- never said I wanted to get 15 degrees. Others have said that anything over 13 is probably excessive. That sounds like it's been echoed by several others, including Rick's comment about a general agreement from others about 12.5 degrees being the target. Rick S.- my airplane has a step for getting into the rear cockpit... never tried "giant stride" stepping into it! And since my deck angle is at 11 degrees, my airplane is about 1.5 degrees nose-down from optimum for full-stalling it in the 3-point attitude. However, my wing is also set at 1 degree *less* incidence than the plans call for, so now my wing is about 2.5 degrees nose-down from optimum. I'm going to try some larger tires (wanted to anyway), but just studying it in AutoCAD, I'll probably only get 1 to 1.5 degrees more deck angle, so I'll still be short of optimum but should be better. This is experimental aviation!